With laser skin resurfacing, you can significantly rejuvenate your skin and improve a number of aesthetic issues that may be having an effect on your appearance. Our board-certified plastic surgeon and aesthetic enhancement team at Richmond Aesthetic Surgery and the Dermlounge med spa offer only the most advanced laser skin rejuvenation procedures available, treatments that can diminish signs of age, improve areas affected by sun damage and discoloration, and provide your skin with a more youthful and healthy glow. Laser skin resurfacing can be an effective alternative for patients who may not need invasive surgery to accomplish their goals, or it can be used in combination with surgical procedures to further enhance results for a more complete cosmetic makeover. During your initial consultation here at Richmond Aesthetic Surgery, we will discuss your options and create a customized treatment plan for your needs. Our practice uses Fractional CO2 laser technology in many of our laser skin resurfacing procedures. 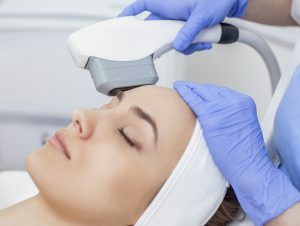 This advanced technique employs carbon dioxide laser energy to penetrate deep into the skin of the targeted area without affecting surrounding tissues. During the procedure, the laser will reduce the outer layers of damaged skin and help the collagen in the deeper layers to grow, ultimately resulting in healthier and more refreshed-looking skin. Laser skin resurfacing typically takes about 15 minutes to an hour to perform, depending on the number and size of the areas being treated. You will likely experience some redness and the feeling of a mild sunburn after the procedure; however, this should quickly fade. Most patients can resume normal daily routines immediately after treatment, though more extensive procedures may require a day or two of recovery. If you would like more information on the benefits of laser skin resurfacing, or if you would like to schedule a consultation here at our practice, please contact Richmond Aesthetic Surgery today.